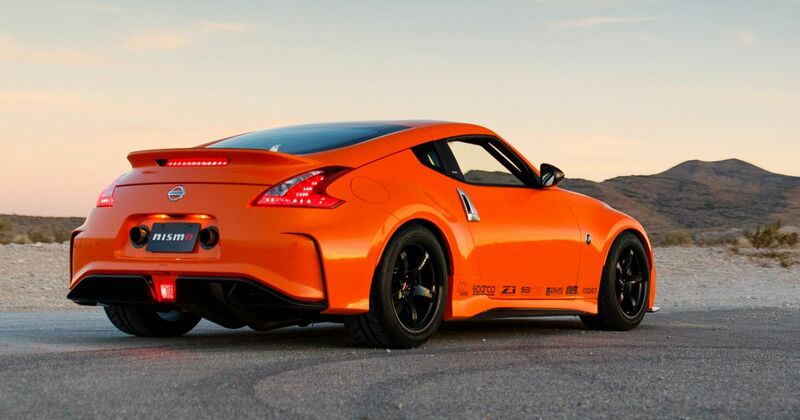 Feast your eyes on the Gloss Burnt Orange-wrapped Nissan Project Clubsport 23, which will meet the public at SEMA 2018. 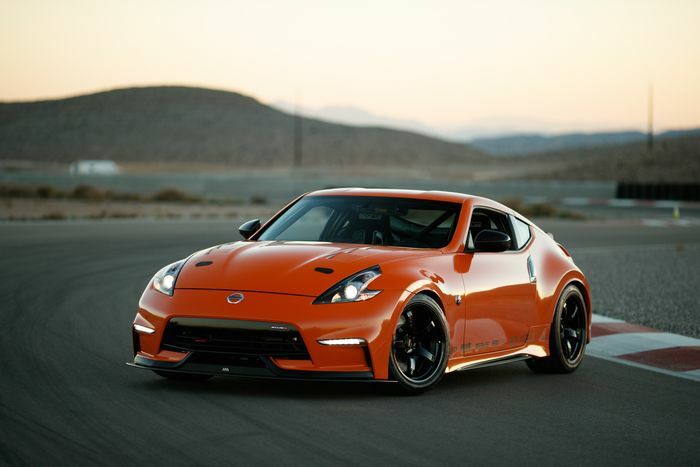 It’s a new collaboration between Nissan and MA Motorsports blending OEM, aftermarket and bespoke new parts to create an example of a tuner’s dream 370Z. The base 2012 car’s characterful but ageing 3.7-litre VQ37VHR V6 has been replaced with a twin-turbo VR30DDTT from the Infiniti Q50; a change that has been rumoured for the 370Z’s successor. 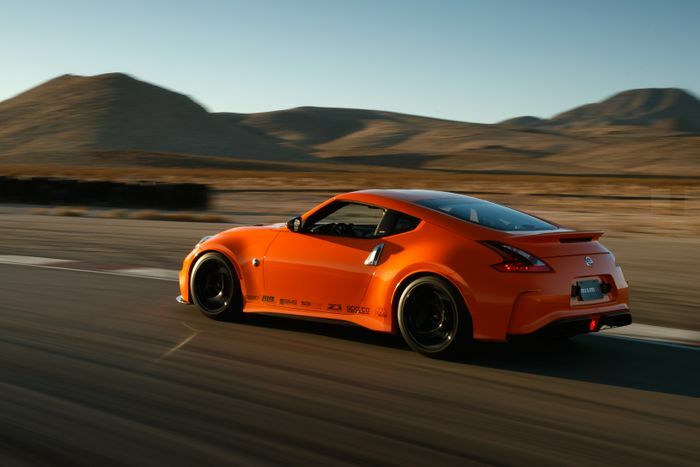 Impressively, the 370Z’s existing six-speed manual gearbox can handle the extra torque and Nissan has re-engineered it to fit, even though the VR series of engines were never designed to be used with manual transmissions. That makes it a 400bhp manual coupe with plenty more motorsport-derived treats on board. MA Motorsports provided an upgraded clutch, flywheel and differential cooler for Nissan’s Nismo GT Pro-Carbon limited-slip differential. The upgrades list includes the likes of an AMS Performance cold air intake, Z1 Motorsports blow-off valves and a bespoke new MA-built exhaust system with twin black exits either side of the number plate. They look awesome. The cooling system is upgraded, including coolers for the power steering system, and the brakes have been swapped for monster track-biased items. Nismo’s brand new Street/Track pads grip Z1 Motorsports two-piece slotted rotors and are helped along by Nismo braided steel brake lines. Various suspension components have seen Nismo upgrades on top of KW Variant 3 coilovers and Eibach rear springs, and we love the Nismo-branded Rays flow-formed alloys wrapped in Hankook RS4 rubber. Bodywork changes include Nismo and MA body kit pieces and the Speedesign Custom Graphics wrap. Everything you see on the car could be available to buy through US Nissan dealers soon. Or, if there’s too little interest, it won’t. Certain parts like the brake pads and the wheels are confirmed and Nissan is thinking about offering a “builder’s kit” comprising all the parts and wiring to make something like the Project Clubsport 23 happen in your own garage. Nissan says that the parts on show at SEMA, starting 30 October, are works in progress and continuous development is still happening. We can’t speak for you, but we think it looks pretty damn good already.